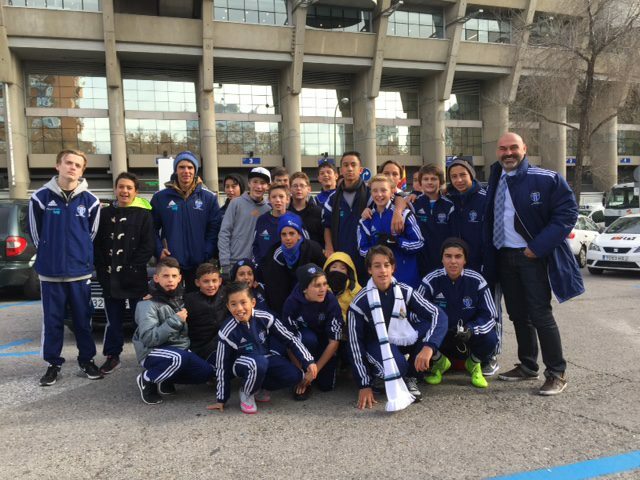 South Melbourne Juniors with SMFC technical director Strati Xynas outside the Bernabau Stadium, the home of Real Madrid. The birthplace of Picasso, Don Quixote and Tiki Taka football has welcomed a band of young footballers from South Melbourne FC (Hellas) who are hoping to benefit from some of the powerful training methods that have made Spanish teams so admired around the world. The 25 boys, comprising two teams of U12s and U14s, are on a 12-day pilgrimage to Madrid, where they are observing and playing matches against some of the best of Spain’s footballing youth in five tour matches in the capital Madrid. Their opponents include youth teams of La Liga clubs Getafe, Rayo Vallecano and Atletico Madrid. There are also games planned against a Spanish National Youth team and, probably the most exciting of all, a game against the boys of Real Madrid. South Melbourne FC technical director Strati Xynas, club president Leo Athanasakis and Director Andrew Mesourouni are accompanying the players and have been suitably starstruck posing in front of the Bernabau, and alongside Real Madrid legends Zinedine Zidane and Vincente Del Bosque. The tour has been facilitated by Genova International Soccer School (GISS) whose director Maurice Pagniello is a South Melbourne fan. GISS have academies all over the world and connections in Europe. Last Sunday, the youngsters were treated to a visit to the Bernabau to watch Real Madrid and the BBC (Benzema, Bale and Christiano) demolish Sporting Gijon 5-1 in just Real’s second match under new coach Zidane. The following day, the South youngsters had the opportunity to train with Real Madrid youth coaches at the Home of Spanish football, where the national teams of Spain train. According to Xynas, it’s also where the South youngsters are being accommodated throughout their stay. ” It’s an amazing facility and pure football environment. So we live and train on the premises,” he told Neos Kosmos via email. In midweek matches, South Melbourne youth teams played against teams from both Atletico and Real. Against a super talented Real Madrid side, which included Zidane’s son, the match ended 7-0 in the Spanish team’s favour. Souths fared much better against Atletico Madrid with the U 12s winning 2-1 whilst the U 14’s drew 1-1.